Greater Neponset Flag Football: The Patriots were one of the winning teams in the Greater Neponset Flag Football League championships held last Saturday. Top row: League commissioner Phil Carver, coach Desmond Tyler and coach Charlie Conners. Late this past summer, the youth of Dorchester signed up to satisfy their quest for one of the fastest growing sports: youth flag football. The Greater Neponset Flag Football league commenced at the Garvey Park. 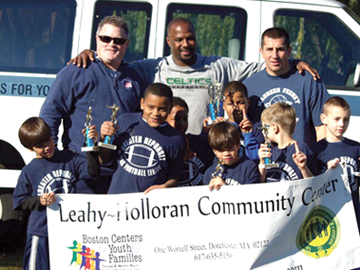 The league commissioner, Phil Carver of the Popes Hill Neighborhood Association, had the foresight to run this program, not only in the fall, but on the heels of the Boston Center for Youth and Families summer program at the Garvey Park. The league serves 250 children and is made up of 18 teams. There are six teams in each age category. The age groups are the Leprechaun Division, the 4-6 year olds, the Bulldog Division, the 7-9 year olds, and the Shamrocks, the 10-12 year olds. The players are taught the rules, concept and intricacies of the game of football. They are also taught to play as a team. The season ended on November 13th when championship games were played for each age group. The Leprechaun Division (4-6 year olds) was won by Coach Charlie Conner’s team the Golden Dawgs, and the Bulldog Division (7-9 year olds) was won by Coach Desmond Tyler’s Patriots. Desmond is putting together a pretty impressive football coaching resume. Finally, the Shamrock Division (10-12 year olds) champs were the Vikings, coached by; you guessed it, Charlie Conners. The season was a huge success and many are looking forward to next season. Until then, the people will have to watch the second most popular football league. What do they call that league again, the NFL?